Sak Yan (handmade Thai tattoos) are an ancient ritual steeped in tradition and applied by masters who believe they hold mystical powers for those who wear them, explains legendary travel writer Joe Cummings. Meticulously applied to different parts of the body, these highly artistic and spiritual images are now gaining mainstream popularity and attention, thanks in no small part to his latest book Sacred Tattoos of Thailand. The author of more than 30 books and arguably one of Thailand’s foremost experts, Cummings shares insights of Sak Yan on a recent edition of Planet Asia Podcast (PA) which is now available for free download on iTunes. From the mysticism that surrounds these tattoos and their protective powers to the ajarn (master) who inked Angelina Jolie’s now famous body art, Cummings dove deep into this fascinating topic with me during a March 2012 interview at the Foreign Correspondents Club of Thailand in Bangkok. The conversation is one of many I’ve had with the author over years, who’s extremely generous with his time, and passionate about each of his projects. This latest book is a collection of stunning photographs shot by Dan White and revealing text by Cummings. 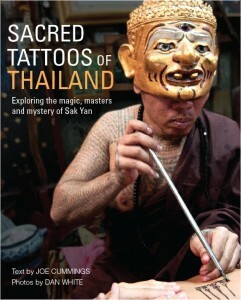 Unlike other tattoo books that have hit the market over the past year, Sacred Tattoos of Thailand not only features rich images but dives into deep detail about their power and history in a highly digestible manner. Have a listen to our conversation.